For many engineers, the frustrating search for hard to find parts ends with Spartan Electronics. Founded in 1973, we are a woman-owned business specializing in hard-to-find, obsolete, and allocated parts. As a full-service stocking distributor, our product line includes such devices as semiconductors, capacitors, connectors, power supplies, and switches, among others. We also offer a wide range of value-added services, including kitting, tape and reel, inventory management, JIT scheduling, testing, and programming. 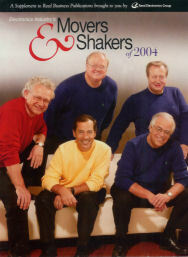 In 2004, we were selected one of the “Movers and Shakers” of the Electronic Industry by Reed Publications. Carol not only achieved the highest sales totals, but experienced outstanding sales growth and performance exceeding her goals. Carol is hard-working, enthusiastic, knowledgable, caring and genuine. Her commitment to her customers is unsurpassed, and her contribution to Spartan has been exceptional! successful business partnership with our valued customers.